By far the most dominate platform in UK Charity CRM is Blackbaud's Raiser's Edge. The challenge faced by Raiser's Edge clients is that the consent module doesn't yet support a permission and consent framework to fully meet the requirements of GDPR and ePrivacy. 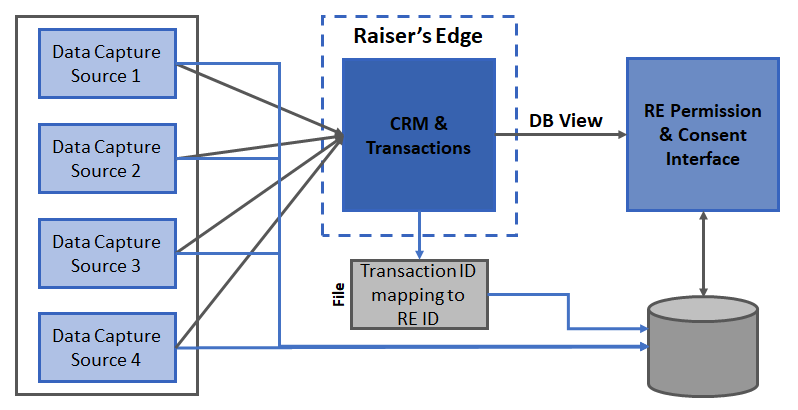 To help clients address the Raiser's Edge limitations Davies March has explored a number of solutions options, leveraging a flexible Permissions and Consents Framework and adding an efficient more useable Permission and Consent Management Interface for updating Raiser's Edge constituents records. The option one model calls for the enhance the data model in the RE consent module. The challenge of this model is the Raisers Edge API for writing to the consent module has a number of limitations including date columns not supporting date time format. To mitigate this Option Two holds the consents in the RE Permission & Consent application.